Sweden has many local traditional embroidery styles. Dala-Floda is one of them, rich in form and colour with lots of different flower motifs. 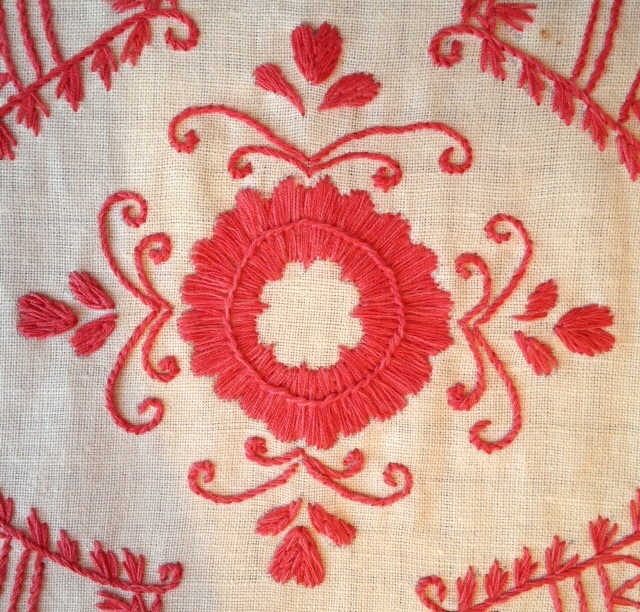 The printed fabric I use for my TAST stitching is inspired by these traditional embroideries. 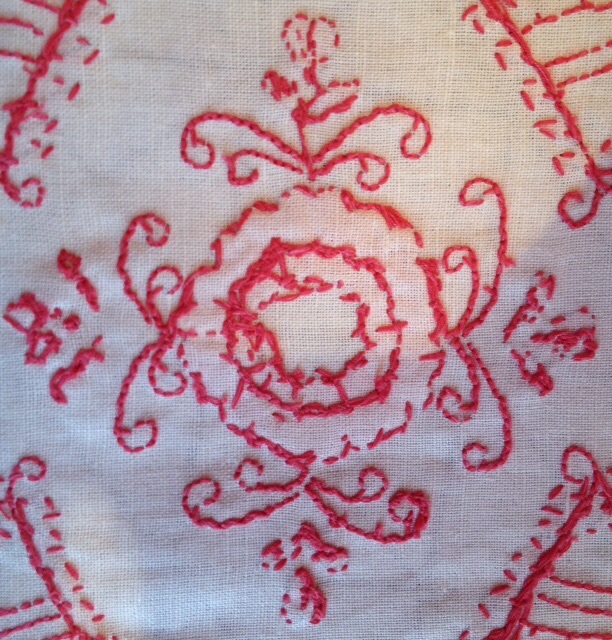 This week I made a lot of Satin Stitch, an important stitch in Dala-Floda embroidery. 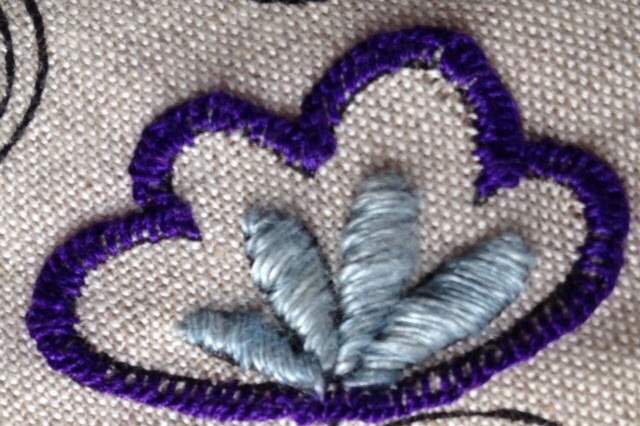 Satin Stitch is often outlined with Stem Stitch, which is the stitch for next week. But as you can see it is almost impossible to wait using them untill next week. 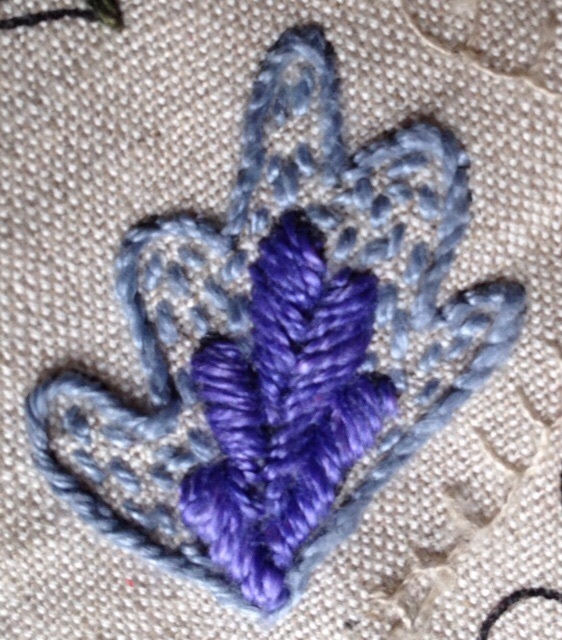 I also tried Padded Satin Stitch. 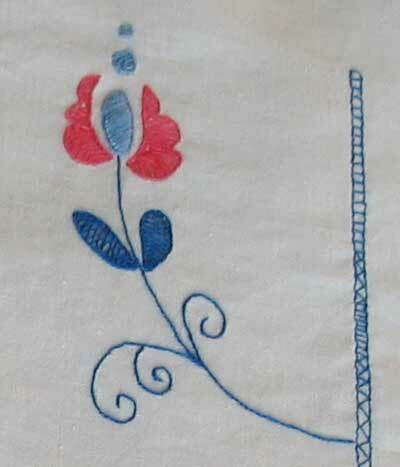 Satin Stitch is also common in other traditional local embroidery styles. In isolated villages material for embroidery was both expensive and rare and nobody could afford any waste. 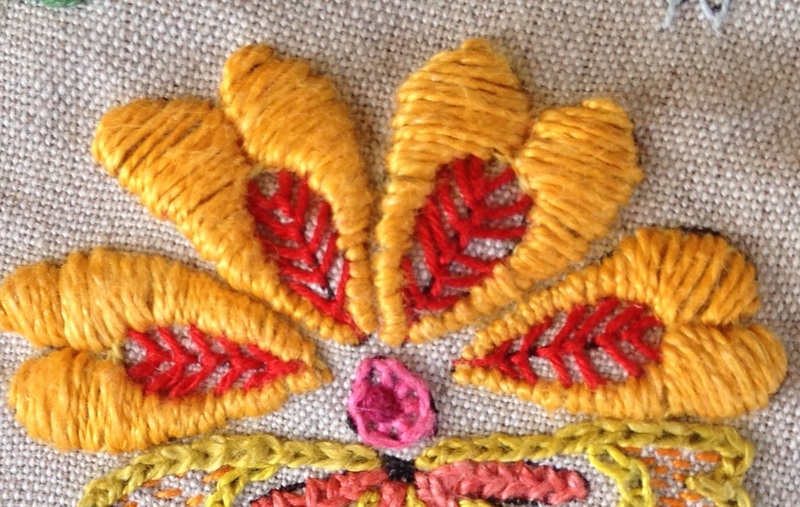 Therefore they used One Sided Satin Stitch, where almost all thread is on the front side of the facric, on the back side there are only tiny little stitches. 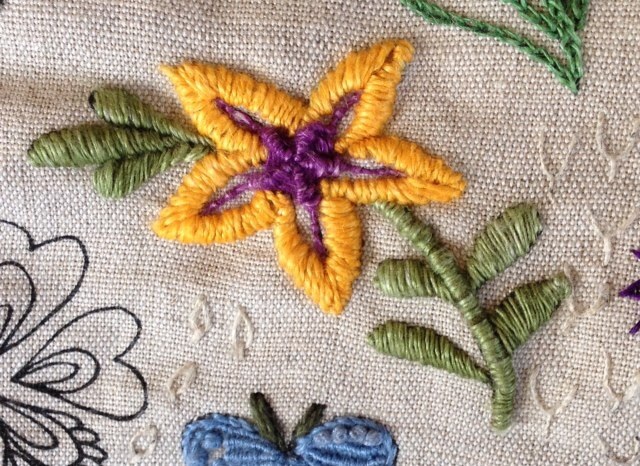 Delsbo is such a place, there you can find Delsbo Seam with big red flowers worked with long one sided satin stitch, sometimes coached down by stem stitch. 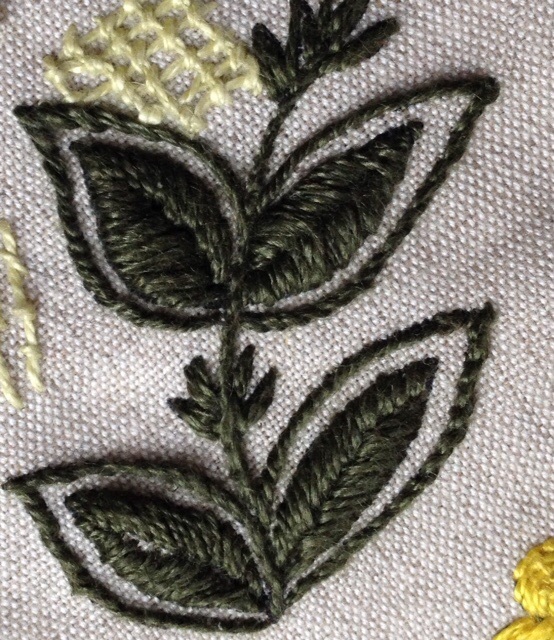 This kind of Satin Stitch is not as even and delicate as regular Satin Stitch, but I find it far more interesting. Here is another example where you even can see the back side. 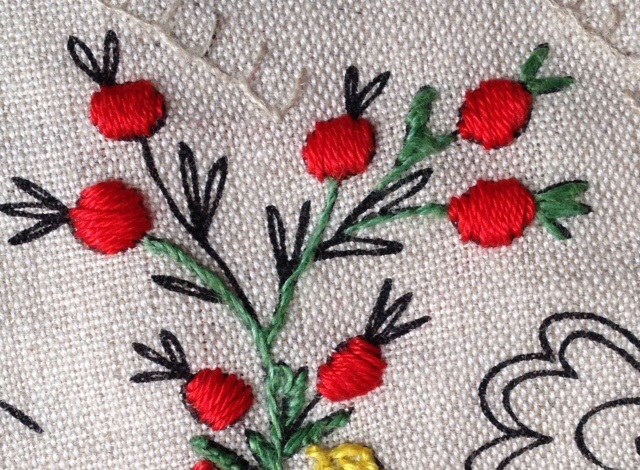 In Blekinge, a province in southwest of Sweden you also can find the one sided satin stitch. Blekinge Seam is distinguished by both colour and certain set of seams. 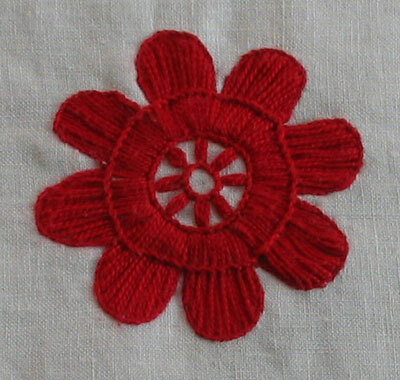 Here is my own interpretation of a Blekinge flower, with one sided satin stitch, Stem Stitch and Herringbone Stitch. This entry was posted on måndag, oktober 12th, 2015 at 23:54	and is filed under Broderi, TAST (in English). You can follow any comments to this entry through the RSS 2.0 feed. Both comments and pings are currently closed.